Big, Bright, and Bold! 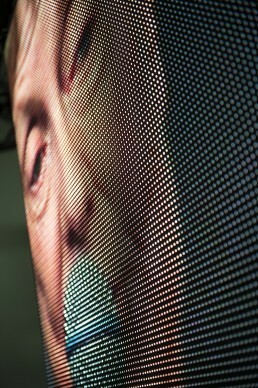 We are a Massachusetts based provider of LED Video Displays for virtually any event, or application. We offer high resolution, high brightness, indoor / outdoor LED video wall technology. Giant video screens (commonly called Jumbotrons) offer enhanced audience experiences for commencements, sports, fairs, concerts, corporate meetings, social media boards, advertising, and more! 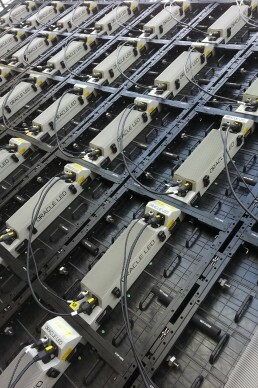 Rentals of mobile, flown, and ground supported display systems. 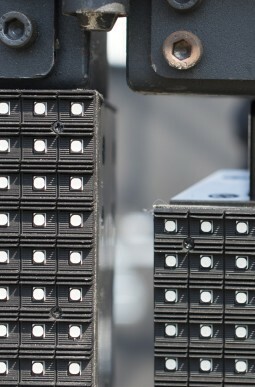 Unique flexible LED modules for digital scenic applications. Click here to learn more! An LED display is made up of a series of modular ‘tiles’ which can be assembled into virtually any size or shape. These panels can be flown from overhead structures, ground supported, or mounted on mobile trailers. How does it make a picture? Each tile relies on thousands of tiny electronic dots that light up dynamically. Seen at a distance, these points of light resolve into a stunning image! Is it a "Jumbotron" or "Diamondvision"? 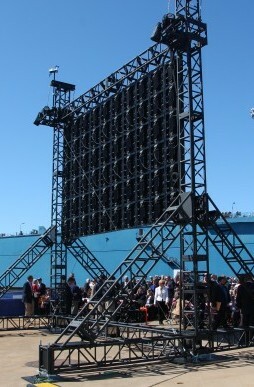 Have you heard someone call it a "Jumbotron", or "Diamondvision"? Those names are both trademarks of different manufacturers. Just as people will often refer to a photo copy as a "Xerox" or a facial tissue as a "Kleenex", you’ll hear a lot of names applied to large format displays. When talking about giant video displays to wow the crowd at any event, it doesn't matter what you call it - it matters how it looks, and where you get it. Where can an LED video wall be used? 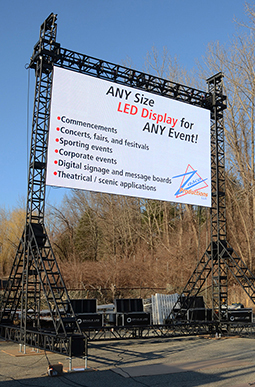 The popularity of giant LED displays has exploded recently - it gives event planners opportunities to display video, graphics, live social media boards, and sponsorships, even in direct sunlight! Commencements and educational events - Concerts, fairs and festivals - Sporting events - Corporate events - Digital signage and message boards - Theatrical/scenic applications and more! There is literally an LED Display application for EVERY event! Modern LED displays can be installed and used in virtually any weather condition: day / night / sun / rain / snow are no problem for our IP65 rated outdoor panels. We are proud to feature Oracle LED Systems’ Award Winning Black Widow HD9 series as our flagship display product. True 9mm resolution, 3-in-1 SMD LED’s for superb clarity! 7,000 nits of brightness so that every image leaps off the screen; even in direct sunlight! Weather resistant to shine through the toughest conditions! Ability to create curved surfaces, plus an innovative frameless flex kit, and other features, make virtually any scenic application possible! 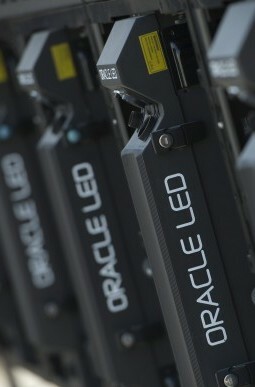 As a member of the Oracle LED Systems Rental network we have preferential access to a large cross-rental inventory. This network of nationwide partners means that we can build nearly any size or number of displays in virtually any location! Our LED displays are truly state-of-the art! At the 2013 PLSN Parnelli Awards, the Black Widow HD9 received an award for "Indispensable Video Technology". Voted by manufacturers, promoters, end-users, clients, and peers in the live event industry, this award represents proof of the product's performance, success, and viability in a market saturated with may different options. 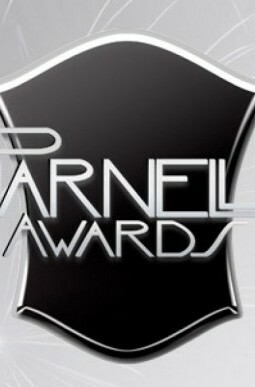 The Parnelli Awards, held in Las Vegas, bring together innovators and professionals from around the production world to recognize the very best in human and technological talent. Our custom designed 30' high truss tower structure from Applied Electronics is ideal for outdoor events. This free standing goal-post style structure is able to support our Oracle LED Systems Black Widow HD9 LED video walls in sizes up to 20' wide. Screen height is variable and can trim at approximately 27' to the top of the screen. Now available for rental or production services this custom engineered system includes several unique features: A compact footprint of approximately 23.5' x 21.75' allows deployment in a variety of tight spaces. Black powder coated truss for clean look. Engineered wind ratings are achieved without the need for unsightly external guy-wires or ballast. (additional guy wires, ballast, and structural support can be added to increase ratings) Designed to transport easily and setup quickly. Truss can be wrapped in colored or custom printed mesh for enhancing branding, displaying sponsorships, or logos. American made in Newport News, VA Event safety is paramount. Our structure includes stamped engineering documents from a structural engineer licensed in all 50 sates, along with an operations management plan, daily operations plan, high-wind action plan, and safety plan. In addition, we use a weather station to monitor weather conditions, and take appropriate action to ensure the safety of all parties. 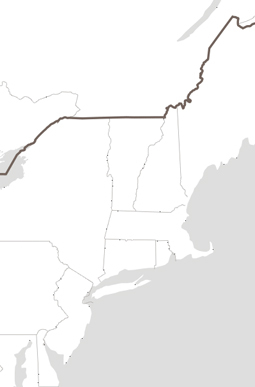 From our central location at the crossroads of New England, our Massachusetts based team and inventory can easily service all of: MA, ME, CT, RI, NH, VT, NY, NJ including all major cities: Chicopee, Springfield, Worcester, Boston, Hartford, New Haven, New York, Providence, Concord, Portland, Augusta, Montpelier, Albany, Buffalo, Rochester, and the World!